5. Keep your professional and personal lives separate. Unless it pertains to your area of expertise, try to avoid posting about politics, religion, and controversial subject matter. 4. Limit the scope of your reactions. Rants might make you (temporarily) feel better, but you never know who could be reading them. 3. If you must use profanity, do so sparingly. 2. Ease up on the lingo. It's okay to abbreviate—especially on Twitter—but lolz ur not a 13 y/o grl. Everything reflects your work. EVERYTHING. So, we're going to have a little refresher via this handy-dandy infographic. :) Thanks, Copyblogger! Whew! I feel better. Don't you? :) Just remember, professional =/= formal. It's okay to still have fun! 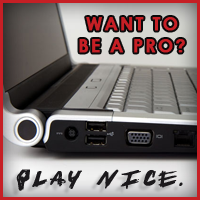 Do you have any tips for acting like a pro online? P.S. I'm a hypocrite, and you'll never take my emoticons from me. Bwahahaha! I always have problems with affect/effect. Great post. It can be so easy to forget to be professional on the internet. Especially if you're sitting alone at home in your pajamas while surfing/blogging. #6 on the grammar list Drives. Me. Crazy. And yeah, Chuck Wendig has elevated profanity to an art form, like the father in "A Christmas Story." And the five tips are spot-on. Every comment matters. Great advice! Especially #4. Opinions are great, but sometimes they don't need to be shared :). That's why I don't post on politics on my blog. Great post. Many things to ponder...and study! Great tips! It's so very important to be professional online. This is one area I have a firm grasp on. I think it's inherent for me, thankfully. And oh, I hate all that texting lingo and get quite irritated when I see teenagers use it, let alone adults. OY! 1. Keep your bias opinions to yourself. I'm not talking political, I'm talking about everything else on the planet. I too often see people make offending comments, yet remain clueless to who they are offending. 2. I would also suggests that people don't openly mock a reviewer who has just given them a 5 star review because the grammar in the review was poor. This is very bad form. 3. And, you know, it doesn't hurt to focus on the positive once in a while. It's not bad if someone has a crappy day and posts about it, but not everyday. Yes, I have some issues with what I've been seeing lately on social media sites, but as I try to follow your above tips and my own, I can't openly rant about them so you get to hear about them here. :) Just remember, you asked. Thanks so much for the reminder, Carrie, and for the great post. Here's hoping EVERYONE pays attention. Great reminders - I think I do fairly well on most of these, but I do make my fair share of mistakes. I'm also terrible at spelling, but I try my hardest. :) Great post! Drats, you missed the one I have problems with: lie, lay, ly. Did I miss one? That's awesome and you're right about all of it. I love Chuck Wendig too. Hah hah hah. Anyway, yeah, I have seen writers I actually liked go off on political/religious rants online before and even though I may have agreed or seen their point, it was a big turn-off. I think you should stick to reading and writing when presenting your online writerly persona! and the grammar tips felt like an old school film strip! ha! Thanks, Elise! :) Hah! That was my favorite part, too. It sold me on the whole re-posting thing. That's one of my speed bumps, too. Sneaky words! I always see people posting about The Biggest Looser, and I'm like, "Stop that!" Thanks, Giles! :) I'm the same way. I'd rather have people comfortable around here. Thanks, Pegasus! :) Oo, good point. It's okay to be extremely excited--especially in the writing world! We ALL get sloppy from time to time and we need to be REMINDED that our grammar should be spot on. Especially in writing our posts. Because you just never know WHO is reading. I saw another great post about using literally. Basically, it's when people use it correctly but it's still not necessary to use it. "I literally drove to work today." These are great guidelines. I think I may just ignore reviews. Hah! Dana, you rock. Seriously, I love this list. :D Thank you! I'm the same way. Once I see someone have a major rant or hissy fit, it taints the way I view them. *shakes her head* It's so avoidable! You're the real pro here! Hah! How awkward is that? You can practically hear crickets! I agree with the profanity. I do not use any F-bombs at all. Why? I just don;t think there is anything to gain. And I gave you a shout out today! Good point, Stephen! :) And thank you. I'll check it out! SO true! I can't bring myself to abbreviate, not even on numbers. Oh, and I punctuate my texts. Ha! Excellent tips, Carrie, and ones I try to follow myself. People with judge you and your writing based on how you present yourself on blogs/ social media, so you should make a good impression.